Le Metier de Beaute Peau Vierge Radiance Serum, 1.7 oz. 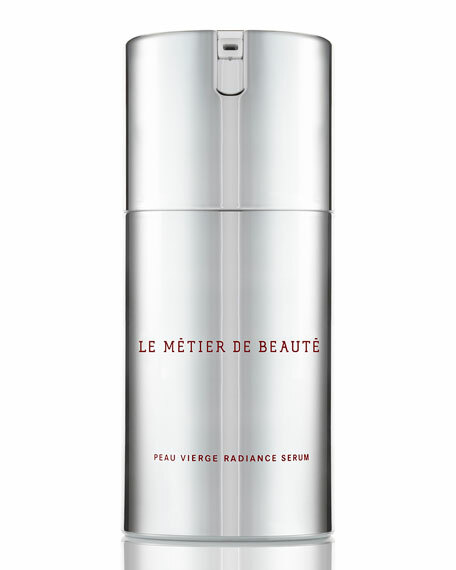 Le Metier de BeautePeau Vierge Radiance Serum, 1.7 oz. Peau Vierge Radiance Serum joins the iconic, Award Winning Peau Vierge family. This daily serum is the secret to young looking skin by refining its architecture, blurring the look of fine lines, enlarged pores and imperfections. Wear underneath Peau Vierge Anti-Aging Complex for a high concentrated youthful glow. TPM Technology®  Increases the absorption of key cosmecuetical ingredients into the skin, increasing therapeutic benefit, while reducing the redness, inflammation and irritation. Hibiscus Syriacus Leaf Cell Extract  Acts as cells-energy stimulator in order to improve the synthesis of collagen and elastin. Licorice Extract  Evens skin tone. Palmitoyl Hexapeptide-12 and Ceramide Complex  Helps diminish the appearance of fine lines and wrinkles, for more youthful looking skin. HOW TO USE: Apply to clean skin as a first product, morning and/or evening. Use gentle massage motions, working under and all around the skin. For in-store inquiries, use sku #1983905.